In Induction Week, Professor Iain Stevenson set up a fiendish treasure hunt for the incoming cohort: this took them on a walk via some key publishing-related sights in London, and ended up, as all good publishing events should, at the pub. All students then submitted a blog about the experience, and these were shortlisted by tutors, who then submitted these to Naomi Barton, one of last year’s group who is an accomplished blogger herself. Naomi offered a limited edition of The Bone Clocks by David Mitchell for the winner, who today has been announced as Lucy Broughton! 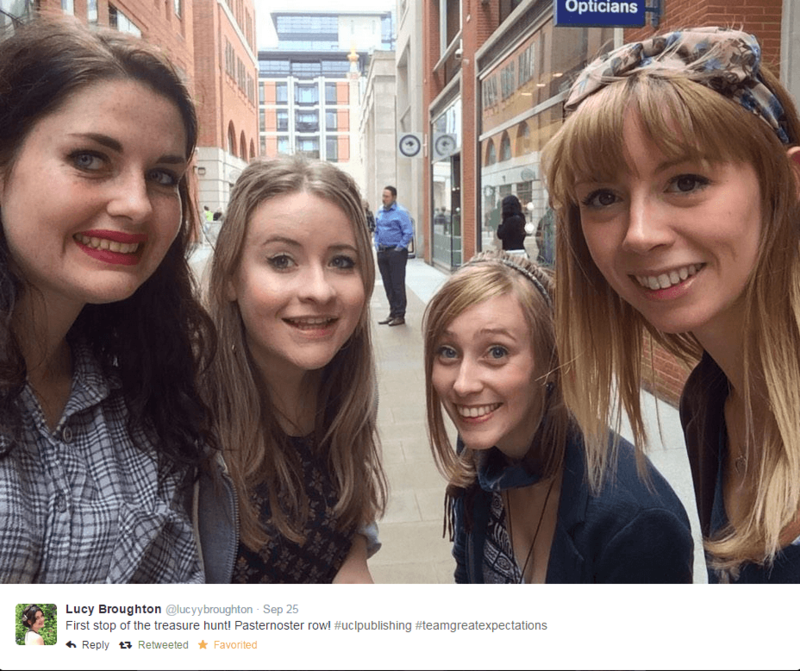 Lucy’s blog is reproduced below – well done, Lucy! Task force: #teamgreatexpectations – Agent Bro, Agent Mac, Agent Hug and Agent Bad. Objective: Crack Professor Iain Stevenson’s cryptic clues to discover hidden gems from the history of publishing, following a route from St Paul’s Cathedral back to base at the main UCL campus, meeting at top secret location The Marlborough Arms by 1700 hours. Progress to be logged by Agent Bro via twitter using the hashtags #uclpublishing and #teamgreatexpectations. Purpose: Team bonding and discovery of London’s publishing history. Pre-mission complication. Agent Mac kidnapped by tube. Fortunately Agents Bro, Hug and Bad successfully complete rescue mission and rally at starting point of St Paul’s Cathedral. 14.19-14.43 hours. Clues 1 and 2. Buildings discovered but agents unsure of the exact subjects of the clue. Appropriate photographic evidence logged with proof of agents’ involvement via the medium of a “selfie”. 14.45 hours. Extra intel gathered between clues. This included the discovery of the site of Bradbury and Evans, who were the printer and publisher of Dickens and Thackeray, and also the site of the Stationers’ Company’s School. 14.50 hours. Clue 3. Team easily located statue of Hodge the Cat. Notable increase in morale. Alert. Discovered by foreign scout. Evasive action taken via different route and tailing group of agents lost before Team Great Expectations could be compromised. 14.56 hours. More intel discovered – the site of Wildy & Sons Ltd, Law Booksellers and Publishers since 1830, in prime law location on the Strand. 15.02 hours. Clue 4. Essex Street location found but no sign of the subject of the clue. Opposing team followed in an attempt to gather intel, but none to be had. Decision made to continue to next clue. 15.26 hours. Clue 5. Observation of counterintuitive traffic at the Savoy. 15.38 hours. Clue 6. Location of historical Aldine building discovered. Troops decide to recuperate in the Cafe Nero it now holds. 16.00 hours. Agent Mac finds appropriate transportation system (bus) to transport troops to next location and conserve energy. 16.29 hours. Clue 7. Agent Hug’s insider knowledge makes Bloomsbury site easy to find. Competing task force scouted and evaded. 16.35 hours. Clue 8. Attempts to discover location prove futile. Despite gathering intel through expert spying on twitter, decision is made to continue to next clue. 16.39 hours. Clue 9. T. S. Eliot plaque found and territory begins to become familiar. 16.45 hours. Troops severely fatigued. Fail to discover the inspiration for Clue 10. Decision is made to continue on to top secret location. 16.50 hours. Target in sight, tired troops powered on through pain to The Marlborough Arms, with a well-deserved drink as reward. Rallied with agents from the wider organisation. Zero casualties.